This three spaces church of St. Michael the Archangel with two towers ended by onions with forged three-armed crosses is one of the smallest wooden temples in eastern Slovakia. It was built in the early 19th century – often referred year of construction is 1836. The historic materials and maps document that the wooden church in Inovce existed even in the half of the 18th century. Wooden church in Inovce is mentioned in the Inventory of Rusyn Tserkvas in Humenne district of 1732. Curiosity of the temple is its peak – style ending of the sanctuary, greater nave and smaller narthex. The iconostasis of the temple has unusually only a three-row architecture without row of prophets and Crucifixion, probably due to lack of space. Its special feature is also the asymmetry – instead of the usual two, it has only one deacon door. The royal door medallions are adorned by the medallion of the Annunciation and the four Evangelists. Polychrome iconostasis is distinctive white and gold, the icons are influenced by Western, namely Latin paintings. 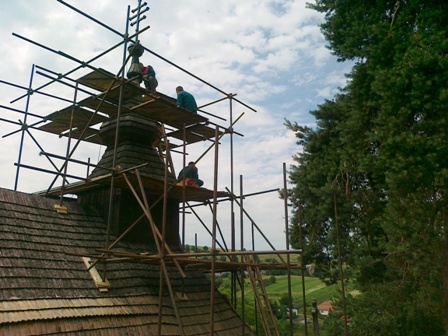 In frame of the project “Restoration of wooden churches, improvement of infrastructure of the Icon Cycloroute” were realized the repair of the shingle roof, external walls of the log as well as the interior, renewal of impregnating coatings against fungi, insects and mold and restoration of iconostasis, altar and cross. The restoration works of most valuable and most damaged icons and other art pieces was realised – icon of altar, icon of “zertvenik”, icon Christ the Teacher and the cross.